TT merry xmas. . HD Wallpaper and background images in the Teen Titans - les jeunes titans club tagged: teen titans raven teen beast boy titans starfire robin. 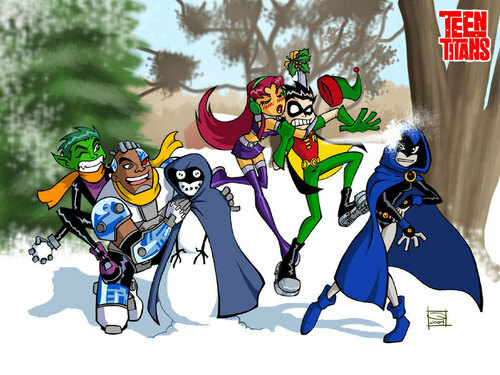 This Teen Titans - les jeunes titans photo contains anime, comic kitabu, manga, cartoon, and mkono. that is so gonna be my christmas card! they should all be wearing thier winter costumes tho. the ones they wore in the episode about Red star. did you know his real name was Starfire in the comics and when Kory came to earth, they all thought the name would suit her aswell? thats wierd, I had no idea, :] I agree with the costumes it would make the card so much more awesome!! This is a photo coz icons r 100x100 on size . the person who created it on deviantart uploaded it as an icon here on icons, I couldn't see it so I just went onto deviant art and then uploaded it as a photo so people could enjoy it. yeh i saw that icon ( well i wound not really call it an icon - it was the wrong size ) . i didn't like it, and that person was rude to me, they were telling me to stop commenting on their stuff. What wait r u meaning my icon coz thats right size - i was talking about the other one and i am really sorry i just was thinking that u were being mean to me sorry u can still comment on my stuff coz i like reading ur comments i am really sorry . I am glad ur not angry and i am glad we r friends and it is a good pic i was going to post it but then i was just going to let u post it coz u were running out of ideas . I like it!It's a really awesome christmas themed picture!